събота, 26 юли 2008 г. The third icon among our examples, St. Nicholas the Miracleworker, with Scenes from His Life, also comes from Sinai, but it is a later work, from the end of the twelfth or the first half of the thirteenth century. The saint is an amalgamation of two St. Nicholases, a bishop of the fourth century and a pious monk of the sixth. 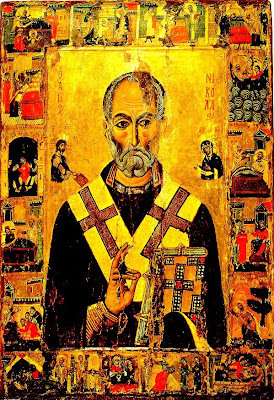 By the twelfth century St. Nicholas has become one of the most beloved and popular saints, not only in the Byzantine Empire but in Russia and the West. He was considered the patron of sailors, seamen, and fishermen, scholars, students and teachers, merchants, traders, marriageable maidens, bankers, and even robbers and thieves. Hagiographical icons of the saint presented in the middle his bust (in Russia, also his standing figure) and a selection of episodes from his life and from his posthumous miracles framing the central image. The icon shown here includes 16 episodes, from the saint's birth to his death. The monumental character of the central panel is softened by an addition of interesting decorative details. The hair and the beard of the saint are fancifully outlined by flowing white curls and the crosses on the saint's omophorion show intricate design. 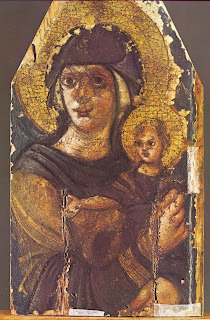 Next to Nicholas' head are two small figures: on the left Christ with a Gospel book, and on the right the Virgin with an omophorion. These two figures allude to the story of the saint's presence at the First Ecumenical Synod in Nicaea in 325. 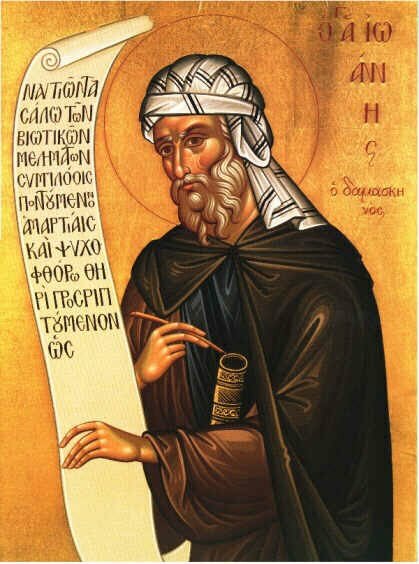 According to the story, Nicholas, angered by the blasphemous words of the heretic Arius against the Holy Trinity, slapped him on the face. For this, he was put in prison and his bishop's attributes, the Gospel Book and the omophorion, were taken from him. However, at night, Christ and the Virgin appeared in his prison cell and returned the Gospel book and the omophorion to him, forcing Emperor Constantine to free the saint and reinstate him as a bishop. In Russia, St. Nicholas became the most popular saint of all, depicted in literally thousands of icons, ranging from simple busts to very elaborate hagiographical icons with more than forty border scenes. сряда, 16 юли 2008 г. 35.5 x 25.5 cm. Encaustic. 6th century. Kiev. Slightly contraposto Mary is clad in a purple maphorion, yellow ochre chiton and embroidered stole; Christ in purple garment. Gold leaf in striations and haloes. Panel has been cut down, perhaps considerably; possibly the original was full length. 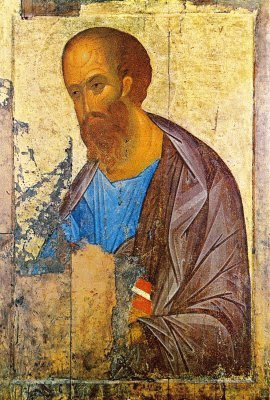 Saint Paul, Andrei Rublev (ca. 1370-1430). About 1394, 160 x 109 cm. Tretyakov Gallery, Moscow. The icon is from the Zvenigorod row. Some experts believe the icon was not painted by Andrei Rublev but by Daniil Cherny, a remarkable Russian icon painter in his own right. Both Andrei Rublev and Daniil Cherny were famous icon painters during their lifetime. They worked together in Moscow, Zvenigorod, Vladimir, etc. Daniil worked in the same manner as Andrei Rublev, which is the reason that some of his icons were ascribed either to him or to Andrei Rublev.